Disney’s long and storied history means that you expect them to accidentally produce similar scenes in their movies. It would be almost impossible for them not to. However, a damning new YouTube video proves that the iconic studio regularly recycled footage in their films simply because they were too lazy to create new sequences. Don’t believe me? Then check out the evidence for yourself below. Warning: There’s a good chance this will instantly ruin your childhood. Kudos to the good folks over at Movie Munchies for finding this evidence. Disney would simply draw over existing animation cells to make new scenes with characters that had similar designs, characteristics, and movements to the originals. The scoundrels. This means that the title character of 1937’s Snow White and the Seven Dwarfs’ movements and dancing during the well known yodelling sequence in their cosy abode could then just be given a quick update for Disney’s 1973 retelling of Robin Hood. 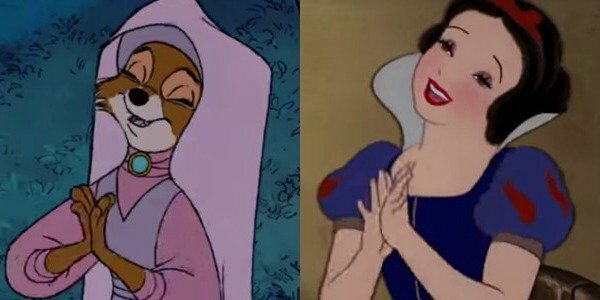 To make this happen, the studio siomply copied Snow White’s animation for Maid Marion as she danced with the mythical band of merry men. Need even more definitive proof? Then check out the picture below. This recycling of animation wasn’t just used on Robin Hood. The dance sequence from 1959’s classic Sleeping Beauty’s later popped up in 1991’s Beauty And The Beast, while further snippets from Robin Hood were also lifted from 1967’s Jungle Book and 1970’s The AristoCats. In fact, when you take into consideration that most of Disney’s stories are adapted from fairy tales, novels, and children’s books, the lack of originality in these films is quite startling. This isn’t the first time that such a video has started to circulate online. "Recycled movements on Disney’s movies" has been watched 4.4 million times on YouTube, and it tells the same sad story. Just to funkier music. When you consider just how arduous a task it was to create this animation back in the day, frame by frame and by hand, and the fact that these similarities have mostly gone unnoticed for the last couple of decades, I think we can cut the lazy sods a little slack.